Description: It's wonderful to again have access to the latest releases of Genzmer's music by this label. Although these works date from as early as 1947 (the trio) to 1999 (the second flute sonata), the qualities of this composer's music - feasibility for the performer and accessibility for the listener - bind them together. One can't really speak of stylistic change since Genzmer adjusts his style solely to the needs of the performer or the instrumentation. 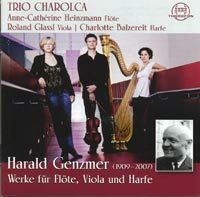 I think I once suggested that Genzmer was kind of like a French Hindemith and the elegance and style of his gebrauchsmusik still makes that comparison hold up. Trio Charolca.